We explain Volvo AWD systems here. 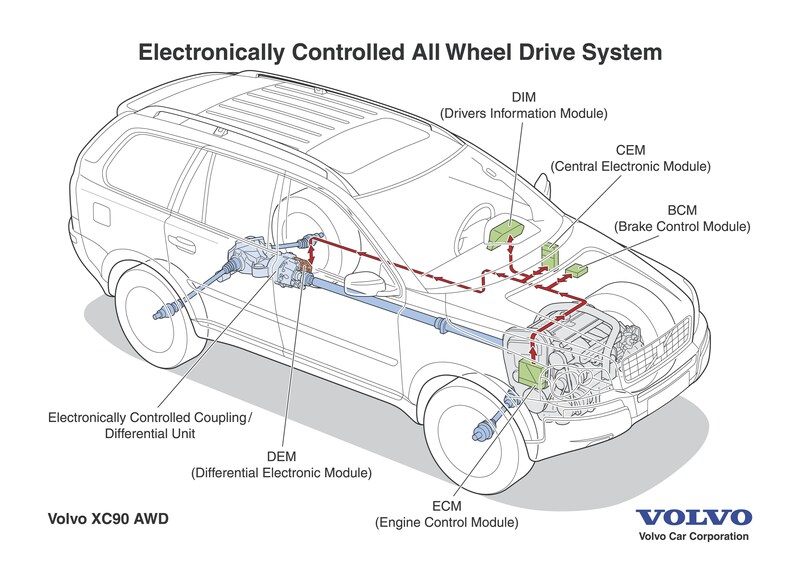 These explanations cover the first three Haldex generations, from the first Volvo AWD in the 1997 XC70 to the AWD systems used in Volvo's late 2000s cars and SUVs like XC70, XC90, S60 AWD, V70 AWD and V50 AWD wagon. See the forum post Why is Volvo’s AWD system so delicate? for more on the Gen 1 Volvo AWD system. It’s less delicate but still needs care. […] VC’s on the P2 models seemed to have been very low trouble and so far I’m not aware of those getting vibrations and other VC issues. I also do not see the VC on those sling out oil from midsection of the VC. 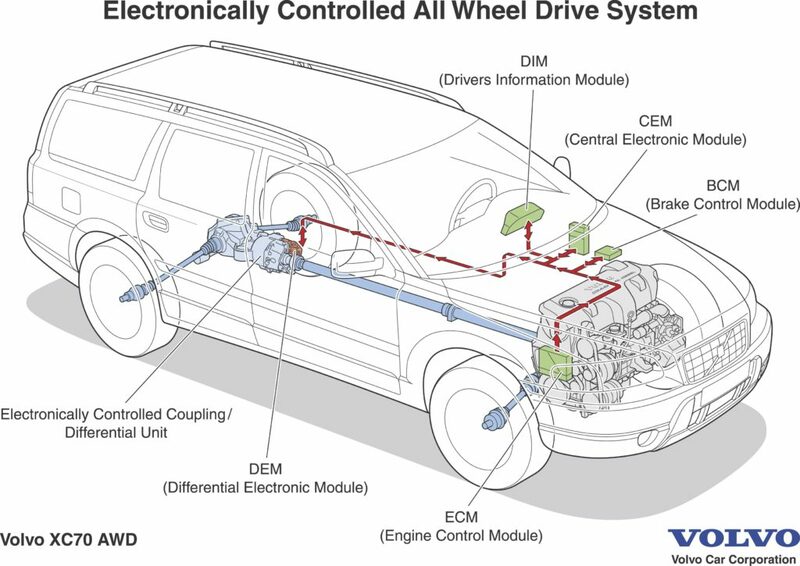 The XC90s electronically controlled all-wheel drive system is completely automatic, and one of the most technically sophisticated systems on the market today. By comparison with the earlier Volvo all-wheel drive systems based on a viscous coupling differential, the new AWD system is much more swift in its response. One of the front wheels need only start to slip through a seventh of a single wheel revolution for the system to divert more power to the rear wheels. This means that the new AWD system provides much better starting traction on difficult surfaces, minimising the risk, for instance, of the front wheels digging themselves into soft sand. The ‘heavier’ the driving surface is, e.g. wet sand or mud, the greater the difference and the advantages compared with the earlier system. Normally anything between 5 and 65 percent of the power is delivered to the rear wheels, depending on the driving conditions. Changes in the amount of power diverted to the rear wheels take place extremely quickly but smoothly, without the driver even noticing. Managing the distribution of power between right and left is the Traction Control System (TRACS), Volvo’s traction system. TRACS intervenes when necessary by braking one wheel to increase the relative power to the wheel with the best traction. This means that the AWD system, working in conjunction with TRACS, can distribute power to the wheels, which have the best traction at any given time. In more normal driving on good surfaces, the electronic AWD system further enhances the car-like qualities of the Volvo XC90. The steering precision is excellent even when accelerating hard – anything resembling torque steer is virtually eliminated by the rapid response of the new system in combination with the new precision steering gear from ZF. When the XC90 is being parked, the AWD system is controlled to prevent the front and rear axles from ‘competing’ for power at angles up to full lock, ensuring easy manoeuvring for the driver. When the vehicle is braked, the system is deactivated so that the brake and ABS systems can function effectively, for high stability and short braking distances. Similarly, the AWD system is deactivated by the Dynamic Stability and Traction Control system (DSTC) if this performs any braking intervention to counteract skidding. 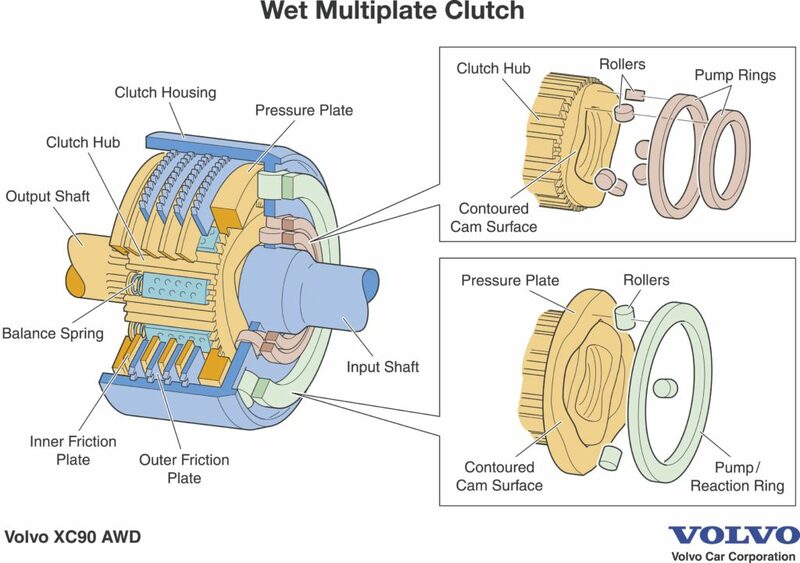 The system has three main parts: a hydraulic pump which is actuated by differences in speed between the axles, a ‘wet’ multi-disc coupling, and a control valve with electronics. The whole coupling can be regarded as a hydraulic pump in which the pump housing and the ring-shaped piston are connected to one axle, while the piston control unit is connected to the other axle. When both axles are rotating at the same speed, no pumping takes place. As soon as a difference in speed arises, the system starts pumping oil. Because the pump used is a reciprocating pump, its action is virtually instantaneous, avoiding the delay inherent in a slower type of pump. The oil is pumped to a coupling piston, which compresses the multi-disc portion of the coupling, thereby reducing the speed difference. From here the oil is returned to a tank via an adjustable check valve which controls the oil pressure and therefore the pressure on the coupling discs. 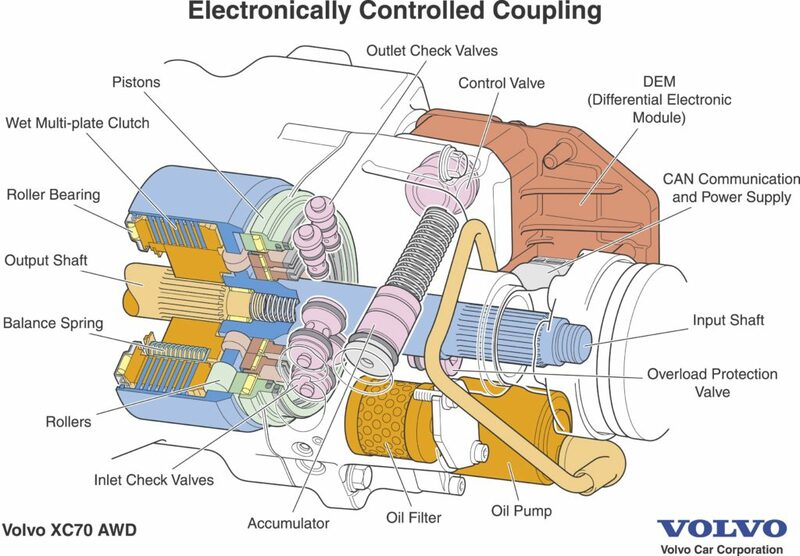 Electronic control means that the coupling responds ideally in a whole range of driving situations. All [Generation 3+ AWD System] are very low in problems other than a pressure/temp sensor that has been updated. The latest [AWD system] sheds the mechanical pump altogether and uses a high pressure electrical pump so it is lighter and simpler. […] The 2002 S60 AWD and all 2003 and later use a hydraulic clutch system made by Haldex/Borg-Warner. There are 4 versions through today. 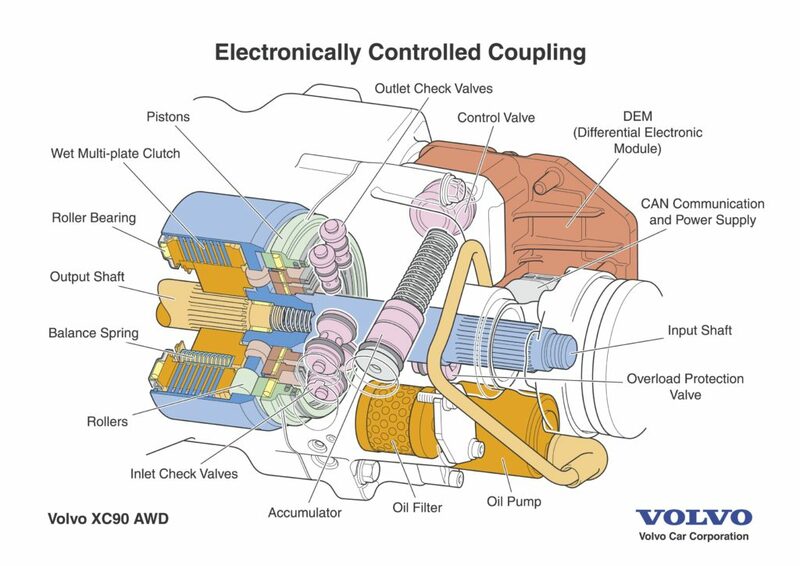 I am looking for a manual for the complete rebuild of the AOC/Haldex for my automatic transmission 2007 Volvo S60 R.
I have a spare unit that was delivered not fully assembled. Need to know how the clutch discs go back in, etc. Have NOT been able to find such a manual via searching the Web… extensively.